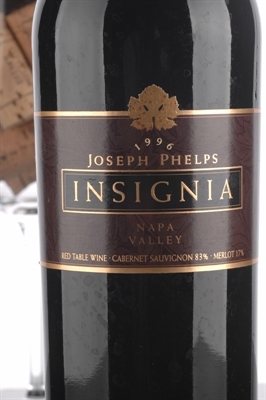 The 1996 Insignia (83% Cabernet Sauvignon and 17% Merlot) exhibits a dark purple color in addition to an elegant nose of cedar wood, fruitcake, coffee, and black currants. The 1996 Insignia (83% Cabernet Sauvignon and 17% Merlot) exhibits a dark purple color in addition to an elegant nose of cedar wood, fruitcake, coffee, and black currants. Medium to full-bodied, with a firm underpinning of tannin, classic black currant flavors, and a long finish, this effort is impressive, but tight and narrowly-constructed.